The second half of the H level work platforms for the Vehicle Assembly Building arrived today at NASA’s Kennedy Space Center in Florida. The H platforms are the third of 10 levels of platforms that will support processing of the Space Launch System (SLS) rocket and Orion spacecraft for the journey to Mars. 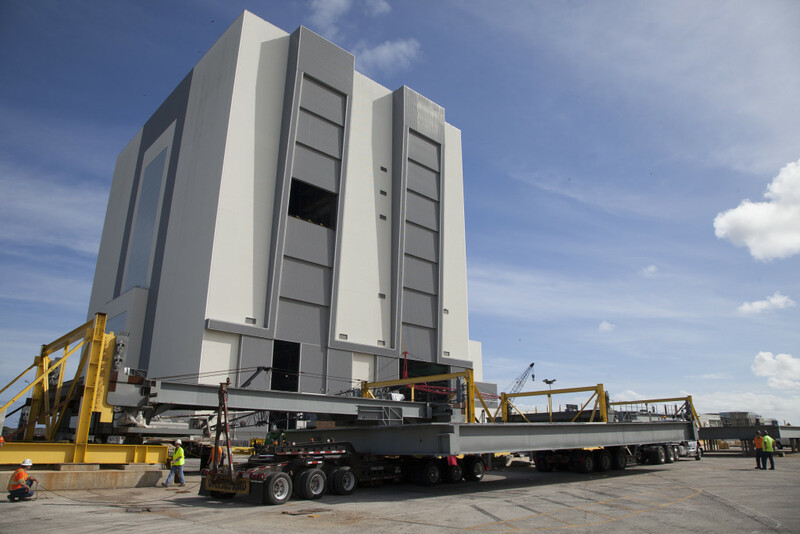 Hensel Phelps moved Platform H on an over-sized load, heavy transport trailer from the Sauer Company in Oak Hill, Florida, and was successfully delivered to the VAB west parking lot work area. As the platform was being transported through Titusville, the edge of the platform contacted a light pole near US1 and DeLeon Street. There was no personal injury and the City of Titusville is working the repairs. There was very minor damage to the platform and no indication of structural damage. A total of 10 levels of new platforms, 20 platform halves altogether, will be used to access, test and process the SLS rocket and Orion spacecraft in High Bay 3. Twenty new elevator landings and access ways are being constructed for each platform level. The high bay also will accommodate the 355-foot-tall mobile launcher tower that will carry the rocket and spacecraft atop the crawler-transporter to Launch Pad 39B. The platforms are being fabricated by Steel LLC of Scottdale, Georgia, and assembled by Sauer. A contract to modify High Bay 3 was awarded to Hensel Phelps Construction Co. of Orlando, Florida, in March 2014. The Ground Systems Development and Operations Program at Kennedy is overseeing upgrades and modifications to the high bay to prepare for NASA’s exploration missions to deep-space destinations. The first two sets of platforms, J and K, were delivered to Kennedy earlier this year. To read more about the new work platforms, visit http://go.nasa.gov/1ba5T6V. 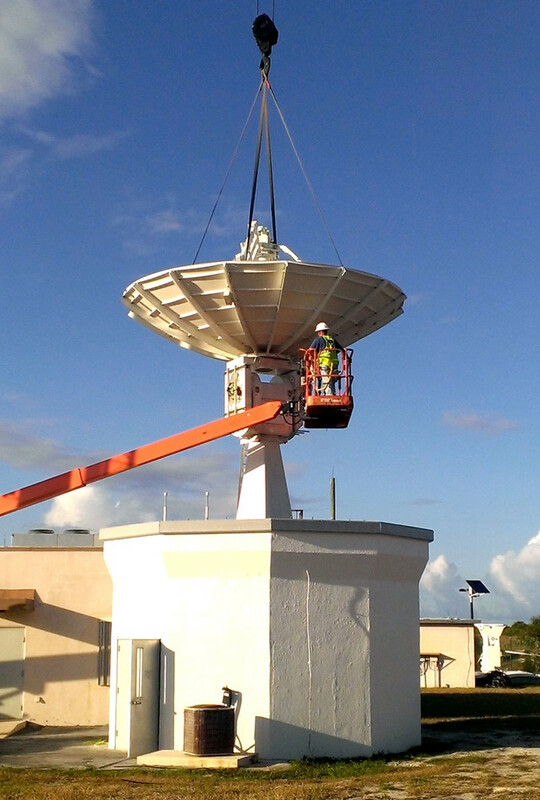 Engineers and technicians from NASA’s Kennedy Space Center and contractor ViaSat Inc. are completing restoration of a launch communications site at the Ponce De Leon Inlet Tracking Annex. The facility is located in New Smyrna Beach, Florida, 35 miles north of the spaceport. The annex will provide a crucial tracking capability following liftoff of the agency’s Space Launch System (SLS) rocket. Carlsbad, California, based ViaSat recently installed the S-band dish antenna site that will provide tracking during the second and third minutes after liftoff. One minute into flight, the line-of-site from Kennedy tracking antennas are obscured because of the highly reflective plume from the SLS solid rocket boosters. The S-band portion of the microwave spectrum combines command, voice and television signals though a single antenna. The Ponce De Leon Inlet Tracking Annex is being reestablished following decommissioning at the end of the Space Shuttle Program.